Moyea Flash Video MX Pro, one of the best flash video encoder software, that could easily convert video to Flash, FLV encoded by Flash 8 with alpha, F4V, AVC/H.264, Flash 8, and Sorenson Spark video codecs, together with dynamic video compression and audio settings! With a brand-new UI, the latest version 5.0 offers you more gorgeous Flash Player skins, more dazzling video effects and more functions (subtitle adding, Cue Point, etc. ), in addition to the preserved functions from the previous version like video trimming, cropping, watermarking, and audio replacement, batch conversion, etc. With these enhanced functions, this program is to be the best and the must choice for worldwide users. 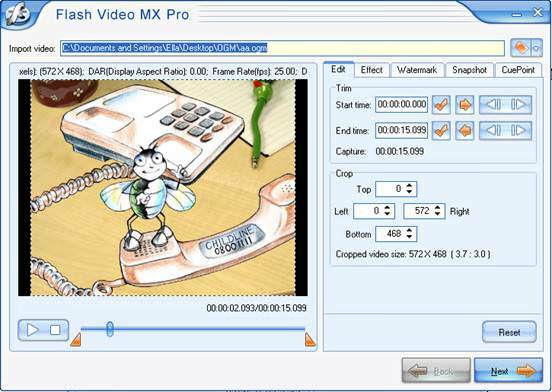 If you need more information please contact the developers of Flash Video MX Pro (Moyea Flash Video Software), or check out their product website.